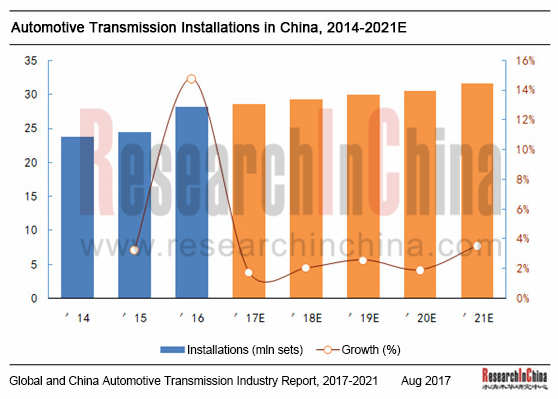 The market demand for transmission, one of essential automotive parts, has direct bearing on the development of the automobile industry. According to China Association of Automobile Manufacturers (CAAM), the country’s auto production and sales hit all-time highs again in 2016, amounting to 28.119 million units and 28.028 million units, up 14.5% and 13.7% year on year, respectively, which in turn drove the demand for transmission up to 28.119 million sets (AM is ignored because of rare demand), a 14.5% rise from a year earlier. Aggregate demand for transmission will expand along with further development of the automobile industry, expected to hit 31.64 million sets in 2021, representing a CAGR of 2.4% during 2016-2021. 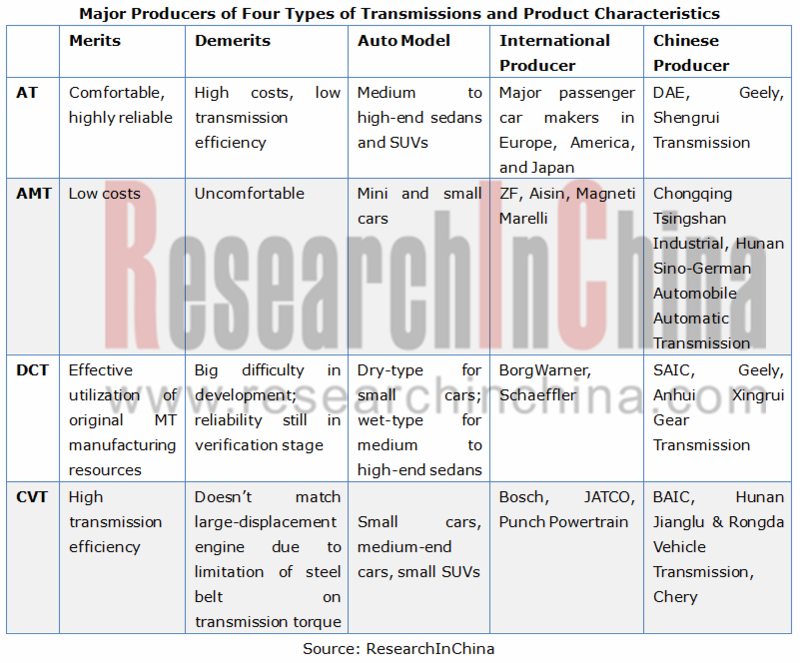 Market structure: In China, automotive transmissions are primarily divided into manual transmission (MT) (including semi-automatic transmission) and automatic transmission (AT) with the latter further classified into stepped transmission (AT/AMT/DCT) and continuously variable transmission (CVT). MT, AT and AMT, all applicable to passenger cars and commercial vehicles, held a 47.6%, 28.0% and 1.4% market share in 2016, respectively; DCT and CVT, generally assembled in passenger cars, occupied a 10.9% and 11.1% market share in the same year, separately. Like other key auto parts, the automotive transmission market remains relatively stable. Local suppliers still cannot replace foreign counterparts due to a large gap in the aspects of strength, precision, vibration noise and anti-fatigue of transmission gear. In the CVT market, Japanese JATCO and Aisin AW are dominant globally, while domestic Zhejiang Wanliyang and Hunan Jianglu&Rongda Vehicle Transmission serve mainly local brands like Chery; in DCT field, with core technologies originating from Luk (a member of the Schaeffler Group) and BorgWarner, the product is widely used in European and American cars (Volkswagen, Ford, etc. ), while domestic BYD and SAIC achieve in-house supply via cooperation; AT suppliers include Japanese Aisin AW and JATCO (AT for passenger cars and light commercial vehicles), Allison (AT for heavy commercial vehicles), and German ZF (AT for passenger cars and light/heavy commercial vehicles), compared with in-house supply for local enterprises like Geely. 7.1.6 Jatco (Guangzhou) Automatic Transmission Ltd.
7.5.5 Dongfeng GETRAG Transmission Co., Ltd.
Hyundai Dymos Powertrain system(Rizhao) co., Ltd.